India's external affair minister, Sushma Swaraj traveled in the historic first-class compartment of a train from the Pietermaritzburg railway station in which years ago Mahatma Gandhi was thrown out from because he refused to give up a first-class seat. She was attending the 2018 version of the BRICS summit and the IBSA (India-Brazil- South Africa) meeting. 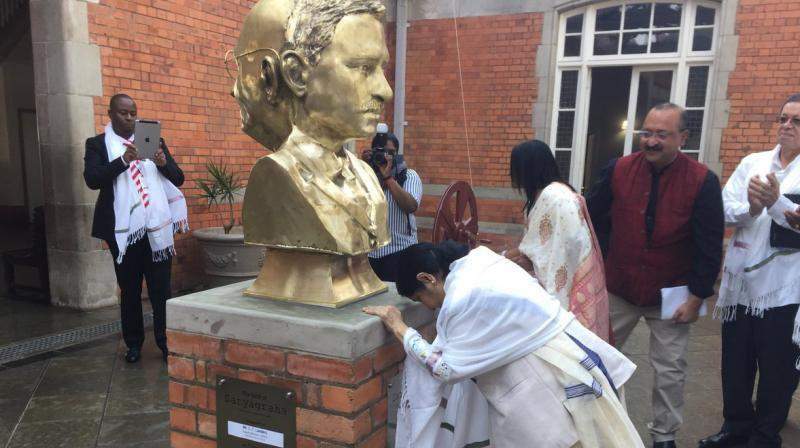 Prior to this Sushma Swaraj had inaugurated a bust of Mahatma Gandhi and a model of the chakra at the station. Scores of people were dressed in white Khadi clothes in support of the inauguration. Sushma Swaraj also visited the digital museum dedicated to Gandhi and inaugurated by Narendra Modi in 2016. In her speech to the public, she spoke about the significant contributions of Gandhi and Nelson Mandela in starting an anti-racism movement and fighting for freedom.